Kogan Agora gets design changes ahead of release. 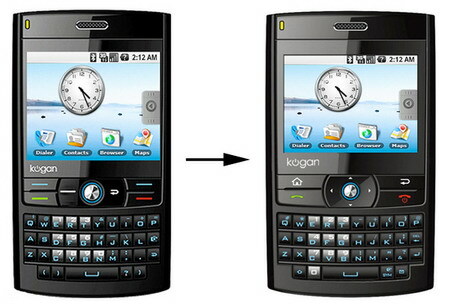 Kogan Agora - World’s Second Android Phone gets tweaked ahead of release -- in Photoshop, anyway. You can check out the photoshop work for confirmation. The new version appears to be wider. The directional pad is smaller. No more shortcut keys are included, and they’ve moved the ‘0' key to a position down in the bottom row. + 2.5-inch TFT-LCD flat touch-sensitive screen. + High-speed 3G network connection. + Easy-to-use email with attachment support for images, videos, music and documents. + Customisable Home Screen with instant Email, text message and IM notifications. + microSD expansion slot for all your storage needs. More information about Kogan Agora is available from the official website. 0 comments on "Kogan Agora gets design changes ahead of release"